The use of active dashboards adds to the existing capabilities of active reports and integrates them using Document Composer Coordinated Compound Report functionality. All active reports in an active dashboard must have the same first (primary) sort field, which can originate from multiple Master Files, but must be the same name and format. The common primary sort (BY) field is used to merge all of the active reports for cross-scenario and cross-report filtering. When an active dashboard is executed, WebFOCUS uses the common primary sort field to automatically build the drop-down list that is used to select sort field values at the top of the page. Multiple active reports are embedded into a compound document to create an active dashboard. 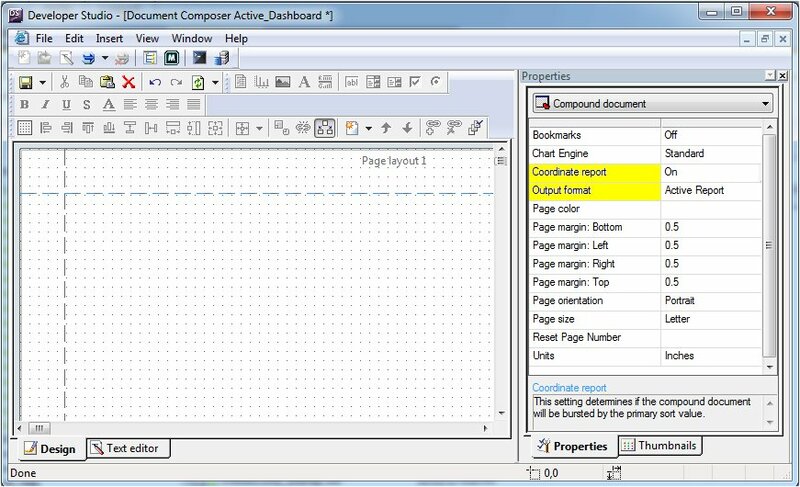 In the compound document Properties window of Document Composer, set the Coordinate report property of the object to On and the Output format to active report, active Flash, or active PDF. Each page layout of a compound document represents a different business scenario and appears as a separate tab at the top of the active dashboard. All active dashboard characteristics are available when using the active Flash output format. You also have the ability to set an active report initial presentation style, which enables active reports to render as reports, pivot tables, or charts. With these types of visualizations packaged into the active report output, active reports can be integrated with Coordinated Compound Reports to present reports, pivot tables, and charts all within the same page. Tip: When you create active dashboards using Document Composer, active reports (regardless of the initial presentation style setting) are to be imported, referenced, or created using the Report object, not the Graph object. Adding active form controls to an active dashboard locks you into the active dashboard mode. For more information, see Active Technologies Dashboard Mode. Ensure that your active reports comply with the characteristics of active dashboards. You can modify an existing active report or create new ones that meet the criteria. Open or create a new report in Report Painter. Select an active report format from the Output Format drop-down list. Select By from the Columns toolbar and add the primary sort field to the active report. The first field must be a visible By field for active dashboards. All values found as the primary sort field will be listed in the active dashboard. Ensure that the first field has the same name as the column name. The first field must be the same name and format for active dashboards. Right-click on the By field and select Column Title from the context menu. The Title dialog box appears. Type the column field name that will be used as the primary sort field among the active dashboards, if applicable. Click OK to close the Title dialog box. Select Format from the Report menu. The Format tab of the Report Options dialog box opens. Click the Initial Presentation drop-down list to select a presentation style for the active report. When the active report is integrated in the active dashboard, it can present reports, pivot tables, and charts all within the same page. Save and close the active report. In the following example, there are three HTML Reports that show REGION as the first visible By field in the report. These active reports comply with the active dashboard characteristics. With the Procedures folder highlighted, select New/Procedure from the File menu. The Add Procedure dialog box opens. Select Composer from the Create with drop-down list. 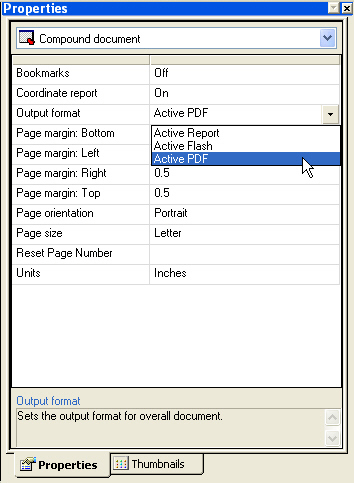 Select active report, active Flash, or active PDF from the Output format properties field. A coordinated compound layout coordinates all reports and graphs from the document with a common sort field. The coordinated report is burst into separate page layouts at run time. Each value for the first sort field displays on a separate page. The following image shows the Properties window with these options selected. Click and drag the crosshair to create a report object and adjust it to the size you want. Import or reference an existing active report. Right-click on the report object and select Import existing report from the context menu. Right-click on the report object and select Reference existing procedure from the context menu. Select the active report and click Open to add it to Document Composer. Position the reports in the document. For more information about positioning reports, see Positioning Report Objects in the Active Technologies Dashboard. Optionally, you can bind objects to an active report. For more information about binding reports, see Binding Objects to an Active Technologies Report. Add an active form control to the document. For more information about active form controls, see How to Add an Active Technologies Form Control to the Layout. Note: Adding an active form control to a document with synchronized active reports results in Document Composer being switched into a limited active dashboard mode. For more information on the active dashboard mode, see Active Technologies Dashboard Mode. You can create multiple views of an active report by binding an active report object to another active report. Binding or synchronizing is the act of configuring an association between an active report and other active report objects in Document Composer. You can synchronize active report objects and show the synchronized report groups in Document Composer. The synchronize options are available from the Positioning toolbar in Document Composer. You can only synchronize objects to one active report at a time. If you try to synchronize an object to a second active report, the first synchronization is removed. When there are objects synchronized to an active report, those objects are updated any time the active report updates. With at least two active report objects on the canvas, select active report, active Flash, or active PDF from the Output format drop-down list of the Compound document Properties window. Select the objects to be synchronized. Select the active report object as the object to be synchronized. While pressing and holding the Ctrl key, select the active report as the report that you want to bind to. The synchronize buttons on the Positioning toolbar are activated. The binding object (active report) is indicated by clear boxes around the edges. The synchronized object (active report object) is indicated by solid black boxes around the edges. Click the Relate Bottom_Left button on the Positioning toolbar. The active report object is synchronized and refreshed with data from the active report. There is no separate procedure associated with these active report objects. If you right-click these items, there are no options to edit the procedure. Select Show relationships from the Positioning toolbar. An arrow displaying the relationship is shown in the layout. To add an active form control, it is required that you insert a new control to the layout. Inserting a control type while the output is set to active reports creates an association between the control and an active report, thereby linking actions to directly affect bound active reports. 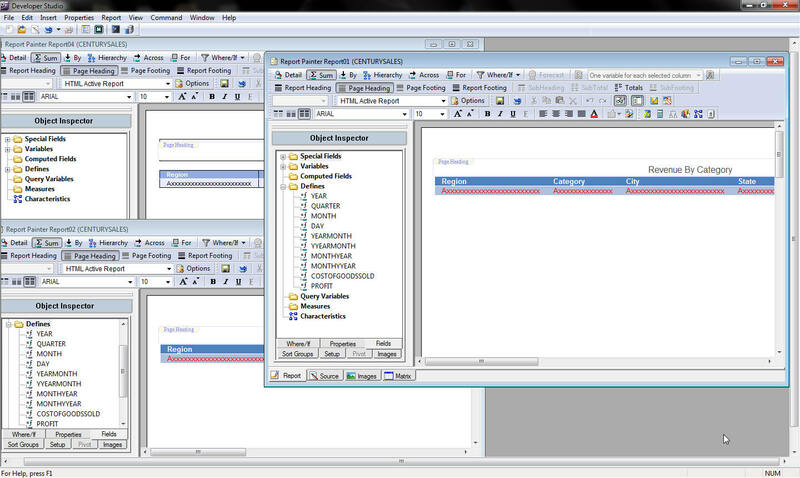 An active form control is only applicable if there are active reports embedded or referenced in Document Composer. Any input control from the Components toolbar can be configured as an active form control. Select the control type (Text Box, Drop Down List, List Box, Radio Button, or Check Box) from the Insert menu or toolbar. Note: There must be at least one active report on the canvas for the input controls to be available. Click and drag the crosshair to create a control object and adjust it to the size you want. The input control is added as an active form control. You can now configure the control by right-clicking the control and selecting Properties and settings. A Dashboard Bar is an additional page layout where you can insert controls, reports, and charts that display above the dashboard tabs. The Dashboard Bar is only available for the active report formatted documents. A Dashboard Bar can be a maximum of one page. You can insert a Dashboard Bar into active Flash and active PDF formatted documents. However, if you run these documents, an empty page will be returned. From the Compound document Property list, select either active report, active PDF, or active Flash. From the Insert menu, click Add Dashboard Bar. The Dashboard Bar is inserted into the document. You can now insert controls, reports, and charts that display above the dashboard tabs. Note: Though the Dashboard Bar can be a full page, it is not recommended that you insert large reports and charts, as this would make the Dashboard Bar appear the same size or larger than the dashboard. The Properties and settings dialog box appears when you right-click an input control. The Properties and settings dialog box is shown in the image below. The selected report will be the report that the target reports are filtered on. The values in Columns will be populated by the columns of the source report. Only one source report can be selected. Lists all columns from the source report. The target reports will be filtered on the selected column value. Only one column can be selected. This option sets the condition for how to populate the target reports. Adds the option to select ALL data source values for the control. When selected, this option causes the default value to be applied to the reports and charts when the page is loaded. This option is not active while Add “ALL” option is selected. When selected, you can select multiple values from a list box or check box. The selected report or reports that the source report will filter. You can select multiple reports by holding down the Ctrl key. You may chain controls to one another by using the Add to current chain button on the Positioning toolbar. Chaining populates controls based on the selected value from the prior control in the chain. With at least two controls on the canvas, select the controls you want to chain. Select the control you want to be first in the chain. While pressing and holding the Ctrl key, select the controls you want to be in the chain from first to last. The chaining buttons on the Positioning toolbar are activated. Click the Add to current chain button on the Positioning toolbar. The selected controls are now chained. The controls will populate based on the selections from each prior control in the chain. To see the chaining relationship between controls, use the Show Chain order button on the Positioning toolbar. You can remove controls from a chain by using the Remove from current chain button on the Positioning toolbar. To see the chaining relationship between controls, use the Show Chain order button on the Positioning toolbar. With a set of chained controls on the canvas, select the first control you want to remove from the chain. While pressing and holding the Ctrl key, select any additional controls you want to remove from the chain. The chaining buttons on the Positioning toolbar are activated. Click the Remove from current chain button on the Positioning toolbar. The selected controls are now unchained. Flash. This option changes the engine to use Fusion charts. Flex. This option changes the engine to use Flex charts. HTML5. This is the default chart option. This option changes the engine to use High charts. Selecting an active report output type (active report, active Flash, active PDF) from the Output format drop-down list of the Compound document Properties window and inserting an active report activates the input controls in the Insert menu and on the toolbar. Adding an active form control switches Document Composer into a limited active dashboard mode. To access the other output types, you must remove any active form controls from the canvas. If there are any active form controls on the canvas, the only available output types will be for active reports.